Yesterday I received a package from my secret pal. I found the package on the way to lunch at Amalfi's so I took the box with me. I tried to open it on the way there, but I found walking and opening packages is not one of my many talents. I ended up opening it up at the restaurant and going through all of the goodies there. She sent me a mango/papaya candle which made the entire package smell delightful. There were also five skeins of yarn: one soft beige acrylic, a burgundy blended yarn that is incredibly soft, some blue sock yarn (I really need to make some socks now! 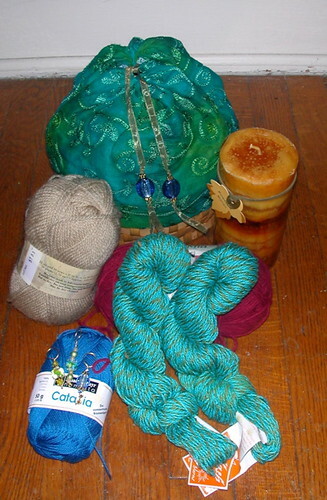 ), and two skeins of turquoise and brown mercerized cotton. I have no idea what I am going to do with all of this yarn, but it will be fun looking for more small projects. In addition to the yarn and the candle she sent some beautiful stitch maker and a basket to store it in. I really like the basket, it is perfect for gifts. I hope she won't mind if I modify the design for Christmas presents. Another highlight of the day was my trip to the Atomic Lounge. They have decided to close their physical store and go exclusively online. This means that all of their merchandise is 40% off right now and will get cheaper and cheaper for the next four weeks. I bought a picture of the last supper that lights up, a CD for Philip and a vintage Jell-O cookbook that I will use with my stash of KoJel. They still have the kitchen cabinet that I have been drooling over since they opened, but I am not sure that I should make that kind of purchase right before I move since I have no idea what my new kitchen will look like. It is a really tough call, but I have four weeks to decide. It's something I really want to try at some point, just don't want to be too much of a pita to people! I didn't sign up for anyone special, my sp does knit with wool, but I have been sending her vegan yarns. I am sending really nice non-wool yarns such as manos and nana yarn so I don't think it is a problem. I also load tons of other fun stuff in the packages.